To some, the choice to dub the grey jay Canada’s national bird is as surprising as the U.S. presidential election results. To some, the choice to dub the grey jay Canada's national bird is as surprising as the U.S. presidential election results. The Royal Canadian Geographical Society announced Wednesday the grey jay trumped more high-profile contenders, including the common loon, snowy owl and Canada goose after a country-wide vote and formal debate.The naming marked the culmination of its much-squawked-about National Bird Project. The nod for the grey jay, also known as the whiskey jack, is ruffling the feathers of many Torontonians who are asking, "The grey what?" I guess I'm not the only one waking up this morning asking "what's a gray jay?" CBC Toronto flapped over to the Royal Ontario Museum to ask ornithologist Mark Peck why the winged winner is an enigma in the city and why the decision isn't strictly for the birds. "It's an exciting day to be a grey jay," he said. "We're all very excited about it." He said the tough and gregarious cousin of the crow and raven is found in every province and territory and lives in Canada year-round, unlike Canadian geese and other species that migrate south in the winter. He explained how the grey jay fits into the Canadian psyche. "They're friendly. They're fun. They're interesting," he said. "They're scavengers. They know how to make things work in Canada." They thrive in winter, nesting in the harshest, darkest months of the year and have been recorded incubating eggs in snowstorms at temperatures as cold as -30 C.
"We should learn from the grey jay," he said. 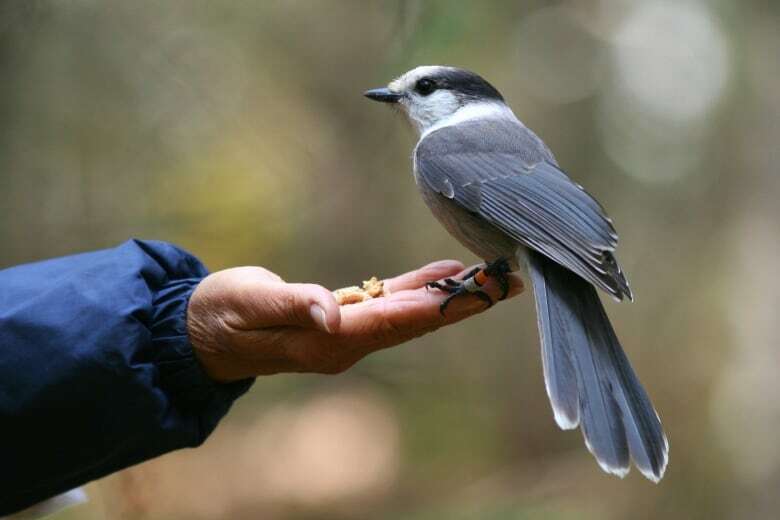 "Grey jays are survivors and they've done it beautifully in Canada for thousands of years." But if you live in Toronto, don't go running for your binoculars just yet. Peck explained grey jays live in the boreal forests and subalpine regions and don't adapt well in places as far south as Toronto. If you're looking to take a selfie with a grey jay, you'll have to head north. "Easiest way to see a grey jay is to take a camping trip up to Algonquin Park for the weekend," he said. "Bring a little bit of bread or some peanuts with you, put your hand out, and there will probably be a grey jay in your hand in about five minutes." The loon actually led Canadian Geographic's national poll of 50,000 respondents with nearly 14,000 votes. The snowy owl came in second and the grey jay third. A spokesperson said staff vetoed the loon and snowy owl because they are already provincial symbols in Ontario and Quebec respectively. "I think this was fixed," Peck quipped. "I think there was a committee made up of grey jay lovers." He said regardless of which bird won, the contest has piqued people's interest in ornithology and is helping inspire a new flock of bird watchers. "All of these species show beauty of the outdoors and encourage people to get outside and look at our wildlife," he said. "It's a win-win for everybody. The grey jay just came out on top." The federal government has not committed to appointing the grey jay Canada's national bird — or any bird for that matter — but the Canadian Geographical Society said the country's upcoming 150th anniversary would be a great time to make the idea fly.